Colonial American. Think about that term. What does it mean to you? It refers to citizens of the American colonies prior to the Revolution. In the minds of many of us in the present-day United States, however, it might denote a unique American identity, probably because our own identities as Americans are firmly set and celebrated. But what if I told you that most of these colonial Americans considered themselves to be loyal British subjects for much of the colonial period and proudly displayed objects that confirmed their loyalty? 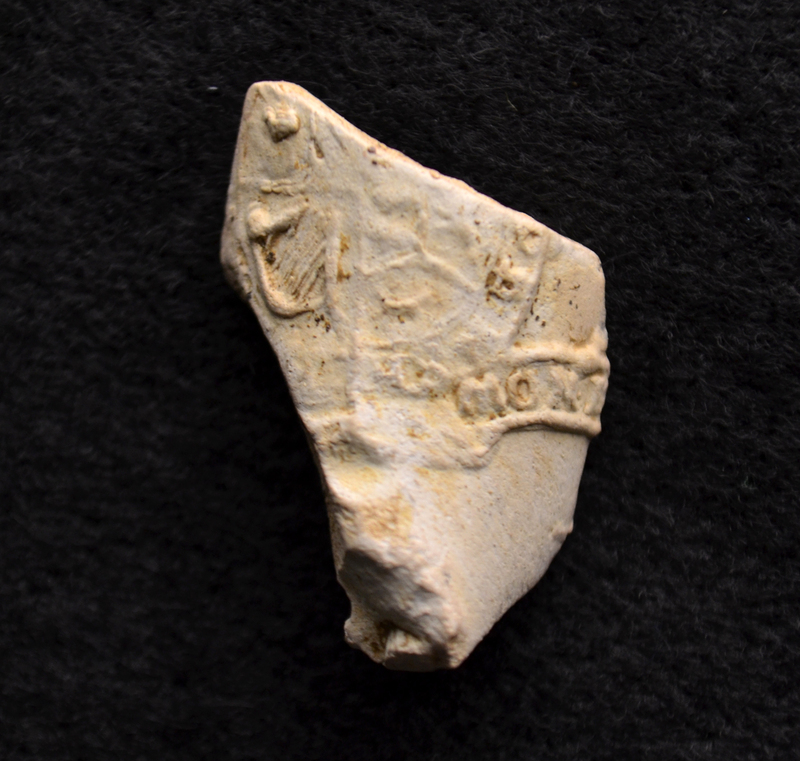 One such object discovered at George Washington’s Ferry Farm is a small fragment from a white clay smoking pipe bowl. The design on this tiny fragment includes a small harp and the letters “Mon D…”. Pipe bowl fragment excavated by archaeologists at George Washington’s Ferry Farm. Sometimes in archaeology we have genuine ‘Ah Ha!’ moments and, for me, this was one such instance. 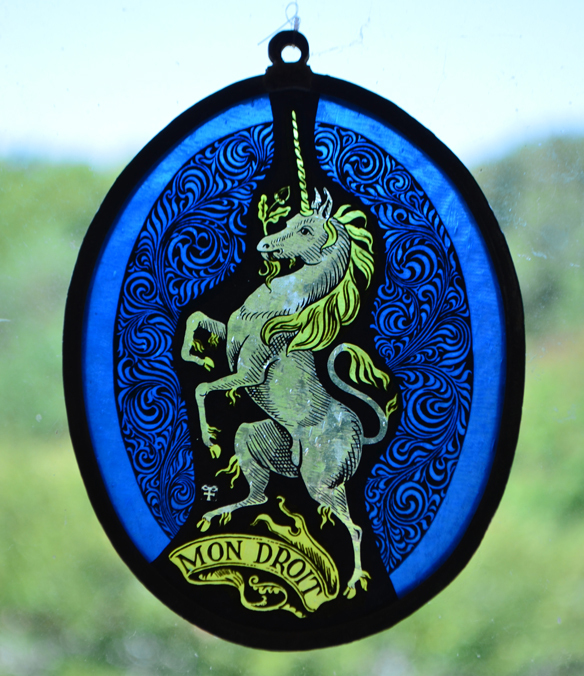 I grew up with a suncatcher – a gift from an English family friend — in my bedroom that featured a rearing unicorn above the words ‘Mon Droit. I loved that suncatcher and, when I saw the pipe fragment, I recognized what the design was right away. It was the British royal coat of arms! On pipe bowls like the one unearthed at Ferry Farm, the coat of arms wrapped around three quarters of the circular bowl. 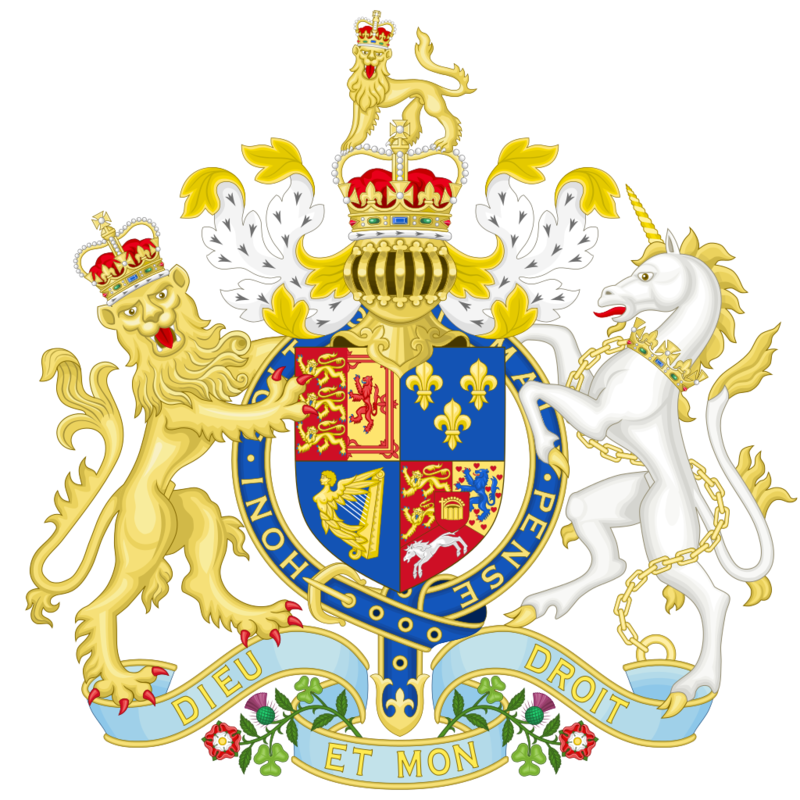 A lion, shield, and unicorn each filled their own quarter of the bowl above the full French phrase “Dieu Et Mon Droit” or “God and my right,” a claim that the right of the British monarch to govern was divine in nature. This phrase has a long history in England. It was first used as a battle cry by Richard I in the 12th century and picked up as a royal motto by King Henry V, who lived from 1386-1422. The use of the French language for an English motto may seem odd but French was very fashionable and the official language of the English court. It is doubtful that anyone living at Ferry Farm after the America Revolution wanted to advertise their loyalty to the British crown so we can safely say this pipe was probably used between 1714, when the Hanover dynasty began under George I, and, at the latest, the 1770s. During most of this time period, the Washington family lived at Ferry Farm.The royal coat of arms is full of important symbols. Grasping the center shield is a lion signifying England and a unicorn representing Scotland. On the shield’s lower left is a harp symbolizing Ireland. The harp is clearly identifiable on the pipe fragment excavated at Ferry Farm. The lower right section of the shield includes a columned monument and another lion. These symbols were added during the House of Hanover’s reign. Monarchs regularly changed the coat of arms as each new king or queen sought to make their mark on the official emblem. The monument and small lion were included on the shield to denote the Hanovers’ rule over their territory in what is now Germany. The fragment found at Ferry Farm also contains these elements indicating that it was manufactured between 1714 and 1800. Pipes featured more than political symbols. This is a 3D image of another smoking pipe bowl excavated at Ferry Farm decorated with a Masonic symbol. The pipe was probably made in the northeast of England between 1770-1810. You can read more about this pipe here. Why is this pipe fragment a big deal? During the 18th century, smoking a pipe with a political symbol like the one we’ve found was the equivalent of slapping a candidate’s bumper sticker on your car, placing a political party’s sign in your yard, or sharing a favorite political meme on social media. The act was public, deliberate, and did not go without notice. The practice continued well into the 1800s when groups such as the Irish employed smoking pipes to advertise their support for causes such as a free Ireland. It was a way to signal identity to others. During most of the colonial period in America, aligning yourself with the crown was not at all radical but rather what was expected of most subjects. In fact, this pipe bowl fragment is not the only artifact excavated at Ferry Farm to hint at past occupants’ loyalty to Britain. As noted in a previous blog, we have found several drinking vessels exhibiting the initials ‘G.R.’ for ‘George Rex’ or King George. In another blog, we also discussed an artifact uncovered at Ferry Farm that points toward a growing resistance to the British crown. This mid-18th century sleeve button depicts William III, who, although he died decades before the button was manufactured, came to represent the right of subjects to resist a king who was abusing power. Close-up of a mid-1700s sleeve link recovered at Ferry Farm. It features the image of King William III. What we may be seeing in these three types of artifacts present at Ferry Farm is a fundamental shift of views within the Washington family as the political climate changed throughout the 1700s. The objects hint at a swing from loyal British subjects to revolutionaries and the beginning of our identity as independent Americans.